In all the figures of the plates the heavy line represents the front rank. The short arrow, placed on the side of the rear rank, indicates that the ranks are faced to the rear. The dotted parallelograms, in the figures, represent the positions the troops had occupied before the commencement of the particular movement. The blank linear parallelograms represent the positions after the first, or intermediate movement. The parallelograms shaded in with small lines represent the ultimate positions of the troops, having executed the movement, or being in march to execute it. The dotted lines (not parallelograms) mark the trace made by the troops in passing from one position to another. the lines the guides have followed, or those on which they ought to have followed. 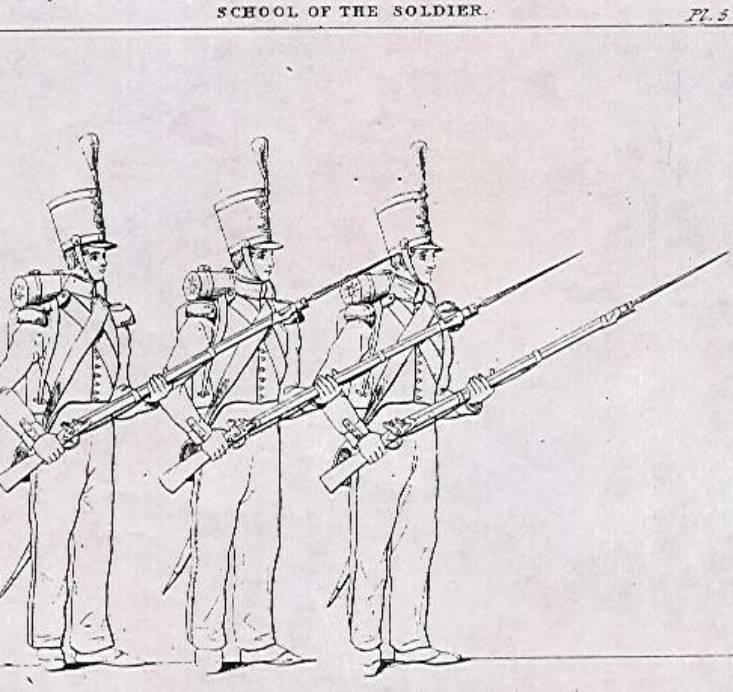 In the figure illustrative of the School of the Battalion, and also, in some illustrative of the Evolutions of the Line, the small squares on the right and left of subdivisions in columns represent the guides. The long arrow seen in many figures denotes the direction of the march. The letter (a) represents the major or his assistant, (the sergeant major,) on foot. The letter (c) represents the captains. The positions of all these letters, in the figures, show the direction in which the persons they represent, face. Represents a battalion in line of battle. The battalion may be in two or three ranks. 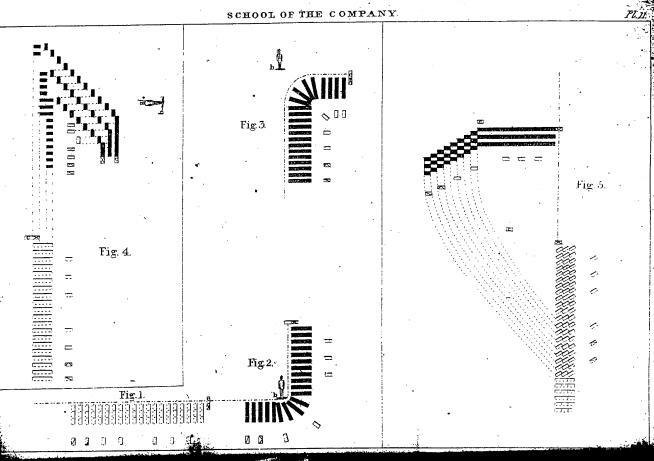 The company of grenadiers is on the right, the company of light infantry or rifle on the left of the battalion, and the eight battalion companies are placed between, from right to left, according to the rank of their captains. Represents a company in three ranks. This company may be supposed to be the left company (light infantry or rifle) in line of battle, with its battalion. On this supposition, the two squares on its left flank, to represent the closing sergeant and the covering corporal, (see No. 32,) are correctly placed, and the square  as well as the pioneer, (both on the rank of file closers,) and the music on the right of the company, will be considered as withdrawn from the figure. 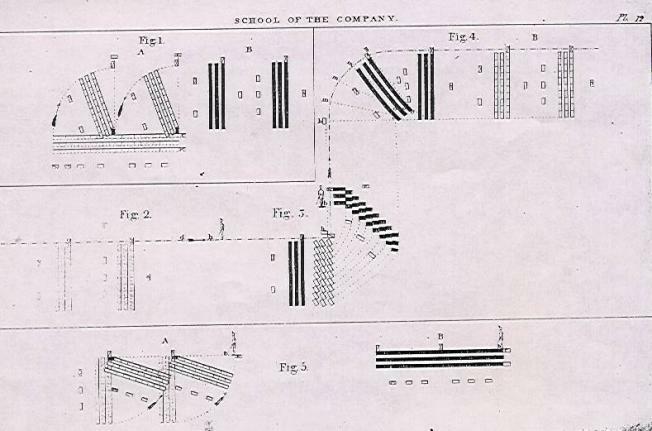 On the supposition that the company is detached, all the parts of the figure are correct, with exception of the squares on the left flank of the company, which represent the closing sergeant and the covering corporal. In this case, these squares will be considered as obliterated, and then the figure will represent any detached company drawn up in three ranks. Represents the mechanism of the oblique step. The recruit has planted his right foot about eighteen inches to the tight, and about the same distance in front of the left heel, which foot describes the diagonal line A B, equal to about twenty-six inches. Represents the soldier under arms. 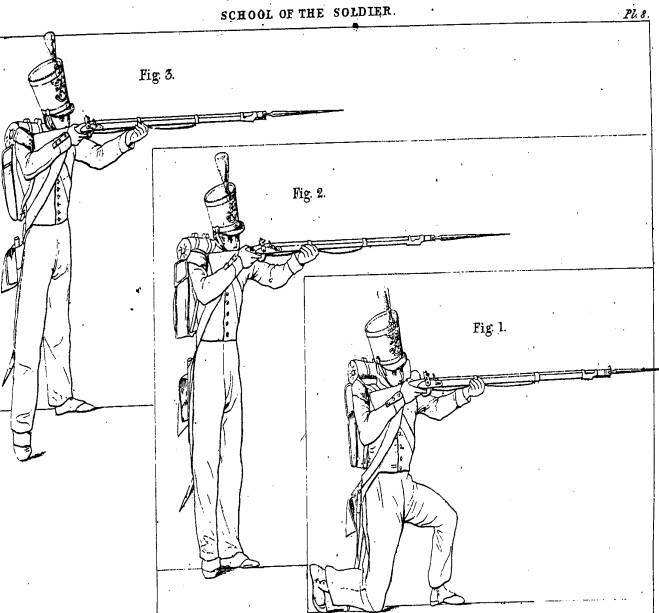 Figure 1 represents the front of the soldier; his toes are turned out, so as to form at the heels an angle a little less than a right angle, because, in this position, the weight of the body is thrown equally on the soles of the feet. The knees are extended without stiffness. The piece is perpendicular, and the whole position is exact, without constraint. The man is represented at the moment of bringing forward the weight of the body upon the foot coming to the ground. Represents the soldier at support arms. Represents the soldier at present arms. Represents the soldier at ordered arms. 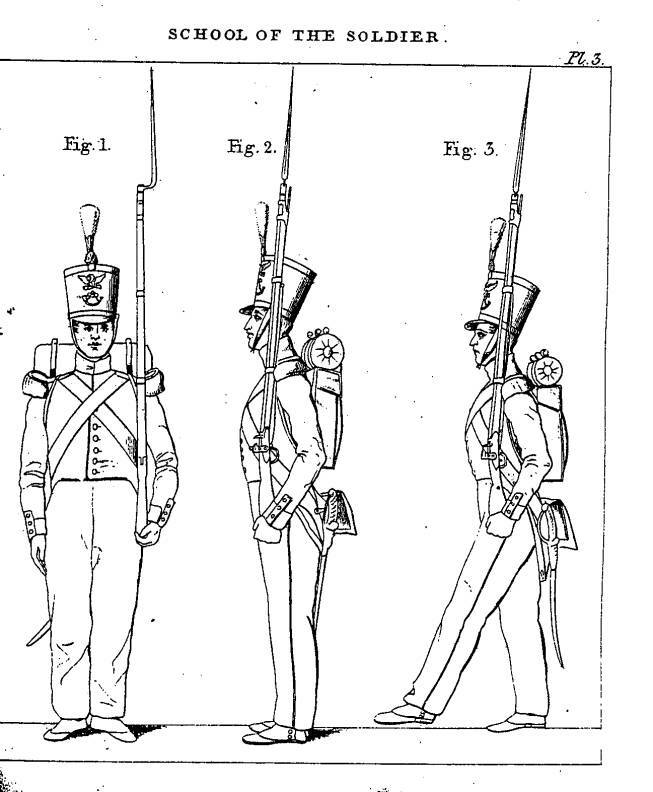 Represents the three ranks charging bayonet. For a formation in two ranks, it is only necessary to consider the front and centre rank men in the figure to be the front and rear rank men, and the third man to be absent. Represents the position of the soldier having executed the first time (or pause) of loading in four times. 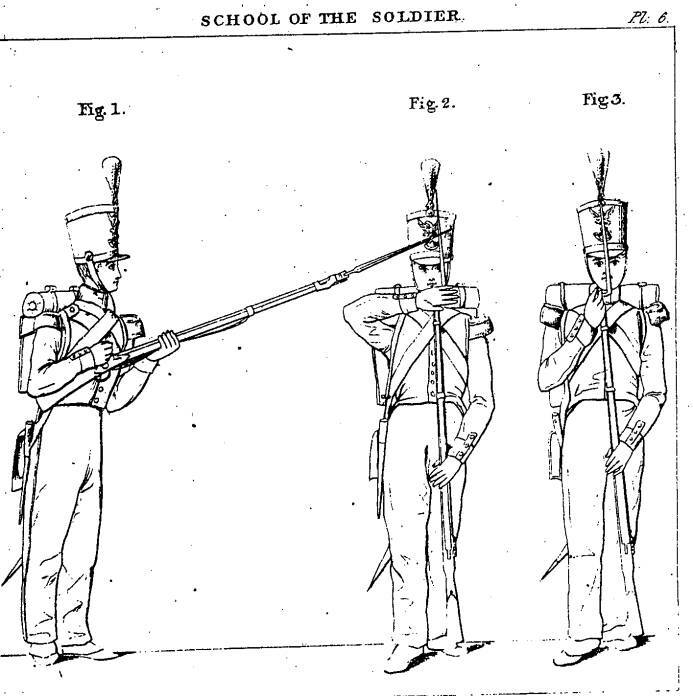 Represents the position of the soldier having executed the second time of loading in four times.. Represents the soldier in the position or arms shifted to the right shoulder. Represents the position of the feet of the three ranks, in the fire direct by the squad or company. Representing a company marching by the right flank, and wheeling by file to the left, and next by file to the right. 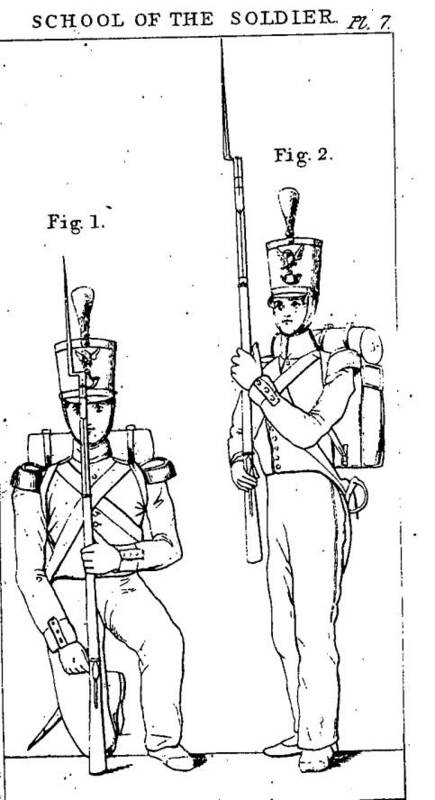 Figure 1 represents the company marching by the right flank: the right-guide is before the front rank man on the right to conduct him, and the captain is placed on the left of his guide; the file closers are two paces from the rear rank, each abreast with his place in the line of battle. 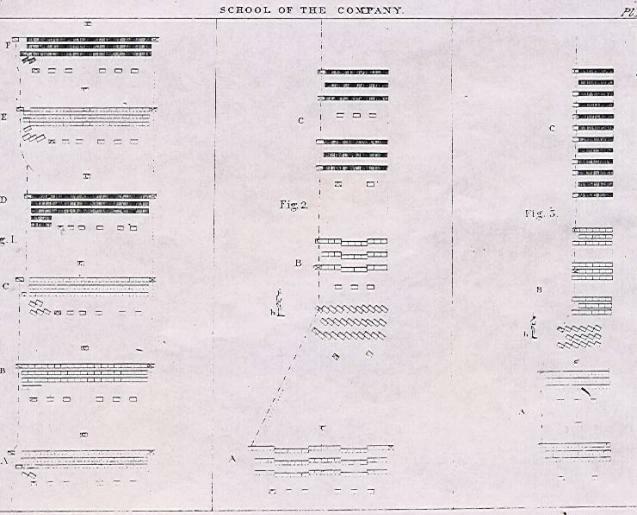 Figure 2 represents the company wheeling by file to the left: the front rank men do not turn too suddenly, they describe a short arc of a small circle, and the centre and rear rank men begin to lengthen the step before arriving at the angle formed by the two directions, in order to come up more promptly abreast with their respective file leaders, now on the left. Figure 3 represents the company wheeling by file to the right. The wheel is made on the same principles as the wheel in figure 2.
point of change of direction, in order to watch over the execution of the movement. Represents a company marching by the right flank, and forming itself on the right by file into line of battle. The head of the company being abreast with the point at which the right is to rest, the movement has commenced; the centre and rear ranks have marked time. The covering sergeant has turned to the right, and the captain has conformed himself to the movement of this sergeant; the captain has been halted by the instructer at the instant he had arrived on the line of battle, and the covering sergeant has placed himself behind the captain. The front rank man, on the right, has continued to march straight forward, and after having passed the covering sergeant, he has turned to the right to come up on the line of battle on the left of the captain; the second man of the same rank has continued to march; after having passed the first, he has turned to the right to move up and place himself on the left of the first. The third man has done the same thing in respect to the second, and so on of the others. to do so. The rear rank has next formed in like manner, or is in march for the purpose, having begun to advance on seeing two men of the centre rank established on the line. Six men of the front rank, four of the centre, and two of the rear, are already established on the line. The instructer has followed the movement from the right towards the left of the line. Represents a company marching by the right flank, and forming itself by company into line. The covering sergeant has continued to march straight forward; the captain has moved rapidly some paces in front, and has faced to his company to superintend the movement. The men have advanced the right shoulder, and have taken the quick step in order to reach the line by the shortest lines; the men of the centre and rear ranks have each followed the exact trace of his file leader; the files have arrived, or are arriving on the line successively, and, on arriving, each has taken, or will take the step of the guide. The company preserves the touch of the elbows towards the right till the captain commands guide left, when the last file has arrived on the line. Each chief of platoon has moved two paces before the centre of his platoon; the covering sergeant has replaced the captain in the front rank. At the instant the movement commenced, the front rank man on the right of each platoon faced to the right; each chief of platoon, by a second movement, has gone by the shortest line a little beyond the point at which the left of his platoon is to rest, and taken care to place himself on a direction perpendicular to the alignment of the company, leaving the necessary space to contain his platoon. Each platoon has wheeled to the right on the principle of wheeling from a halt, and has been halted at the instant the man who conducted the marching flank had arrived at the distance of three paces from the perpendicular. aligned his platoon between this man and the guide. The platoon having been aligned, its chief has commanded front, and placed himself two paces before its centre. A represents the movement at the moment of halting the platoons. B represents the movement ended. Represents a company broken into column by platoon, right in front, preparing to march. The instructer has placed himself thirty paces on front, on the prolongation of the guides. The leading guide has taken two points (d,h) on the line passing between his own and the heels of the instructer. Represents a company marching in column by platoon, right in front, which changes direction to the side of the guide. The column being in march, the instructer has placed on the direction of the guides a marker (h) at the point at which the change of direction ought to be made; this marker presents the breast to the flank of the column. The guide of the leading platoon has directed his march on this marker so as to graze his breast with the left arm. step. Each man, advancing a little the right shoulder, and taking the quick step, carries himself on the alignment, and then takes the step of the guide. The centre and rear rank men follow exactly their file leaders. The second platoon continues to march, and turns to the left when it arrives abreast with the marker. The instructer, placed near the turning point, superintends the execution of the movement. Represents a company marching in column by platoon, right in front, which changes direction to the reverse flank. The instructer has placed a marker (h) at the point at which the change of direction ought to be made. The leading platoon having arrived abreast with the marker, has commenced the arc of a circle, having for its radius the front of the platoon; the men, preserving the touch of the elbows to the side of the guide, execute a wheel to the right; the pivot-man takes steps of full nine inches in order to clear the wheeling point, and the platoon bends a little to the rear. The guide of the second platoon marches exactly in the trace of the guide of the first; arrived abreast with the marker (h) he begins to wheel, taking care to describe the same arc of the circle. The chiefs of platoon turn to their platoons pending the wheel. The instructer, placed near the wheeling point, superintends the execution of the movement. The first platoon has changed direction, and the second is engaged in the wheel. The dotted lines (m,o) indicate the position of the front rank of the platoon at the different points of the wheel. B represents the company marching in column after having changed direction. Represents a company in column by platoon, right in front and at a halt, forming line to the left. The instructer has placed himself in front, on the prolongation of the guides, and faced to them; he has taken a distance from the leading guide a little less than the front of a platoon. The guides have stood fast. The platoons have wheeled to the left on the principle of a wheel form a halt; the front rank man on the left of each has faced to the left, and rested his breast against the arm of the guide; each chief has turned to his platoon to superintend the wheel. rests in the line of battle, has aligned the two platoons. The platoons being aligned, the instructer has ordered the guides to their posts. A represents the two platoons at the moment of halting. Represents a company on march, supposed to make part of a column, right in front, diminishing front of column by platoon. The captain has placed himself before the centre of the first platoon, and admonished it that it has to march straight forward. The first lieutenant has placed himself before the centre of the second platoon, and caused it to mark time. The guide of the first platoon has passed to its left flank the moment it was cleared by the breaking off of the second platoon. A represents the company ready to break or diminish by platoon. B represents it at a moment when, the two platoons being disunited, the second is prepared to oblique. Represents a company marching in column by platoons, right in front, forming company, or increasing front of column by platoon. The first platoon has obliqued to the right in order to unmask the second, which has continued to march straight forward. At the instant the first began to oblique, the guide of this platoon passed to the right flank. The second platoon being unmasked, the first has marked time to wait for it, and, on its coming up abreast, the company has marched forward with the left guide directing. The captain has placed himself before the centre of the company, and the first lieutenant in his post as a file closer. A represents the company before the movement is commenced. B represents the movement at the instant the second platoon is unmasked. Represents a company supposed to make part of a column, right in front, executing the countermarch. and has placed himself by the side of the first to conduct it. The company has afterwards been put in march, the two guides having stood fast. The first file, conducted by the captain, has wheeled to the left around the right guide, and has afterwards been directed, passing along the front rank, so as to arrive two paces behind the left guide; all the files have come to wheel around the right guide, and when the first file was up with the left guide, the company was halted and aligned between the two guides. A represents the commencement of the movement; the company has faced to the right, and the three (or two) first files have broken to the rear. B represents the movement in execution; the files on the right, after having wheeled around the guide, are prolonging themselves in the rear of the new alignment. C represents the movement ended; the two guides have shifted to their proper flanks. Represents a company marching in column by platoon, right in front, which forms on the right into line of battle. The instructer has commanded guide right, and has repaired to the point where the right is to rest in line of battle, facing to the point of direction to the left. The first platoon having arrived abreast with the instructer, has turned to the right; the guide has directed his march so as to cause the man on the right to arrive opposite to the instructer, and the captain has halted the company at the moment the guide was at the distance of three paces from the line of battle. 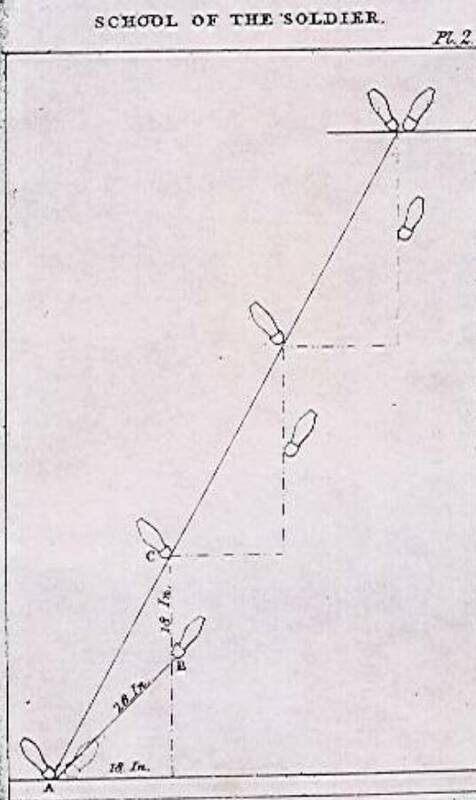 The guide of this platoon has placed himself on the line so as to be opposite to one of the three files on the left; he has faced to the instructer, who has aligned him on the point of direction to the left. This guide having been established on the line, the captain has aligned to first platoon by the right. The second platoon has continued to march straight forward until abreast with the left file of the first; then it turned to the right; the guide has directed his march on the left file of the first, and when at the distance of three paces from the line, the chief of the platoon has commanded: 1. Platoon; 2. HALT; 3. 4. Right-DRESS; and has gone to his place as a file closer. At the command halt, the guide placed himself on the line of battle, on the prolongation of the guide of the first platoon and the instructer, and in a position to be opposite to one of the three files on the left of his platoon. A represents the column in march, having the guide to the left. the first platoon is formed on the line of battle; the second has been halted three paces from that line, and its chief waits to align it as soon as all the files shall have entered into line. Represents a company in march, supposed to make part of a column, right in front, diminishing and increasing front of column by file. 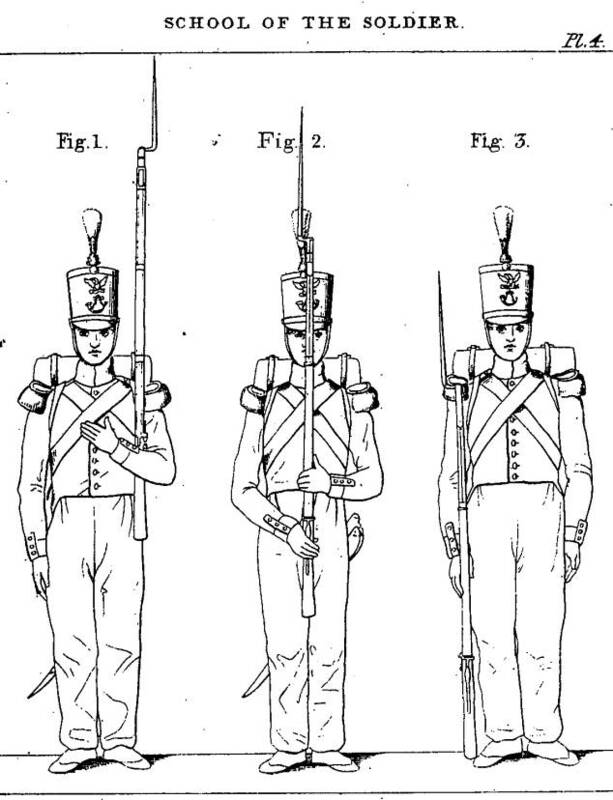 A represents the company breaking of a file to the rear from the left; this file has marked time, and the men of each rank in it, advancing a little the left shoulder, incline to the right in order to march behind the rear rank of the company as soon as the latter shall pass, in succession, the three men of the file. B represents the movement ended; the three men of the broken file follow the three files on the left remaining in line; the left guide has gradually closed on the nearest front rank man in line. in order to place himself between that rank and the old file. D represents the movement ended; the guide has gradually closed to the right on the nearest front rank man remaining in line; the two files, broken off, follow one behind the other, the three files remaining on the left in line. E represents the same company causing a file to return into line; the men of this file have advanced the right shoulder and quickened the step, in order to bring themselves into line on the left of the company; the guide has gradually opened out to the left the space of a file, to make room for the returning one; the men of the file, yet to remain in the rear, have advanced the right shoulder for the purpose of gaining the space of a file to the left. F represents the second file returning into line. Represents a company making part of a column, right in front, marching by the route step, and diminishing front by platoon. A represents the company marching in the route step; the distance from the centre to the front rank, and from the rear to the centre rank, is twenty-eight inches. B represents the same company broken by platoon; the first platoon has continued to march straight forward; the chief of the second platoon has placed himself on the left of the front rank, and the guide has fallen back to the rear rank. The second platoon has obliqued to the right in order to cover the first; the men of the second platoon have half faced to the right in obliquing, in order not to arrest the march of any following subdivision which may be supposed to be in the same column. C represents the movement ended; the second platoon marches behind the first, both in the route step; the chief of the second platoon has placed himself on the left of the front rank, and the guide has fallen back on the left of the rear rank. Represents a company of twenty files marching in column by platoon, in the route step, right on front, and diminishing front by section. A represents the two platoons after having closed ranks in order to break into sections; the chiefs of each platoon are before the centres of their platoons. 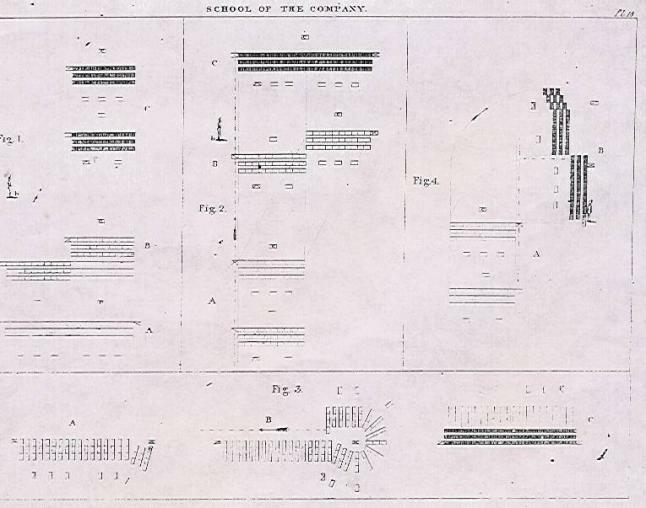 B represents the platoons diminishing front by section; the captain and first lieutenant have placed themselves before the centres of the right sections; the two officers next in rank have placed themselves before the centres of the left sections. step, have half-faced to the right in order to cover the right sections; the two officers next in rank have placed themselves on the left of the left sections in the front rank. C represents the movement ended; the column has resumed the route step, and the ranks have opened out accordingly.